One photographic technique that we like to use at weddings is framing the couple with lights. What we mean by this is including some sort of lighting effects at the margin of the picture. 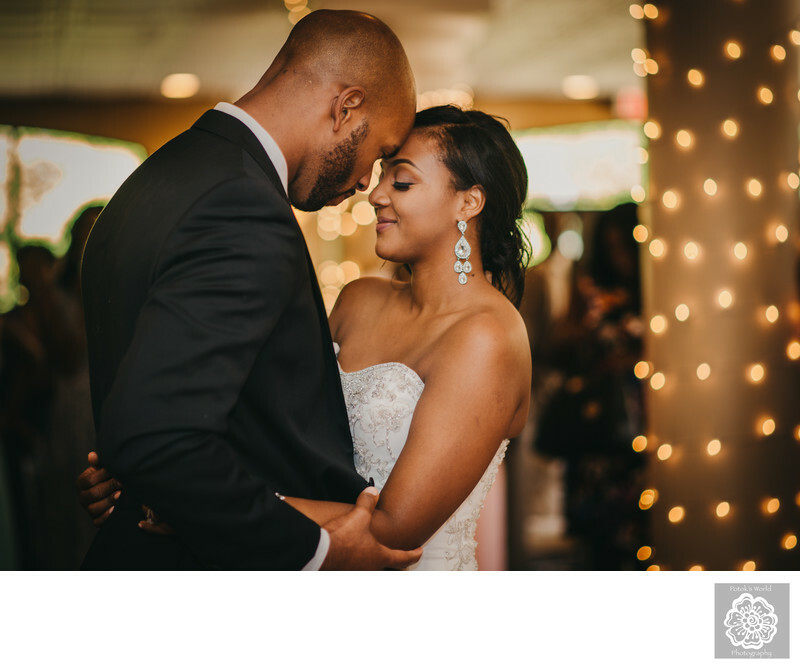 It is a great way to turn good DC wedding photography into the kind that every bride and groom loves. A Washington, DC, wedding photographer generally does this for two reasons. The first is to draw attention to the subjects of the photo: the two people getting married. The photographer composes an image dominated by a consistent and relatively uniform pattern that is generally out of focus. The newlyweds appear in a portion of the frame without that visual pattern. Our optical systems are designed to notice things that stand out. When confronted with uniformity, our eye searches for anomalies. So Washington-based spouses encircled partially or completely by lights immediately become the main focus of the photograph. The other reason why DC wedding photographers frame their brides and grooms with lights is a bit more obvious. It helps create a beautiful image! It allows the photographer to get creative and to turn a normal wedding scene into a work of art. Our job is to photographically document the most meaningful moments of a Washington, DC, marriage celebration. Our responsibility to our clients, however, goes beyond just pointing a camera at everything that happens. We need to create unforgettable images — ones that are as beautiful as the moments are in the memories of the newlyweds. Adding lighting around the edges of the frame is a great way to add artistry to any photograph. And the great thing about this technique is how versatile it is! Framing the couple with lights works just as well in candid shots as it does in couples portraits. A Washington, DC, wedding photographer does not even need to have lighting present in the scene to use the technique. We have a string of small lights that we often use to introduce visual effects into our photography. If there are no lights in the frame, we just use this tool to create some! There are numerous pictures on this website for which we have done this. As it turns out, we did not need to introduce any lighting effects into this particular image. The wedding venue at which these newlyweds had their reception — Harbour View Events — was already helpfully decorated with Christmas lights! Most of the pillars in and around the dance floor area were festooned with these glowing orbs. So creating an image of the newlyweds’ first dance with the effects mentioned above was very easy. It required little more than positioning ourselves such that the lights occupied a significant portion of the frame. We also opened our cameras’ apertures so that everything away from the main focal point got blurry and hazy. The combined effect was the kind of shot that every couple wants. The focus was entirely on them and the overall look of the photo was beautiful. The value of Harbour View Events as a wedding venue did not stop at the helpful lighting setup. Located in Woodbridge, Virginia, the facility is a fantastic place for a marriage celebration. It sits on the banks of the Occoquan River, just 30 minutes from downtown Washington, DC. That gives the venue a lovely rural feel, even though it is conveniently located in a major urban area. The bride and groom at this particular wedding really made great use of that particular feature of Harbour View Events. After the conclusion of their wedding reception, the newlyweds departed in a very unique way. Instead of waving goodbye to their wedding guests and hopping in a luxury car, the couple boarded a boat and headed down the river en route to their honeymoon. Location: Harbour View, 13200 Marina Way, Woodbridge, VA 22191.